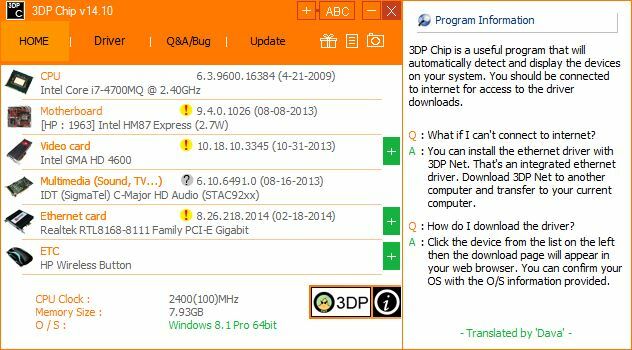 "Check whether your drivers are up to date with 3DP Chip." Make sure all of your drivers are up to date using 3DP Chip, which checks and assesses whether the drivers you are using on your personal computer are up to date by connecting to their servers to check to see if there are newer versions of the drivers that you are using for your hardware. This type of software can be handy in situations in which you do not get provided with software for each piece of important hardware on your computer. Using this type of software will make sure you are aware when there is a newer version and automatically update the drivers for you. However, while 3DP Chip doesn't automatically update the drivers for you, it does check to see if they are out of date and makes sure you know whether or not they are. If the drivers are out of date, the software will have a yellow exclamation mark next to the driver and piece of hardware that is out of date. If you mouse over the exclamation mark, it will show you information of the new version number of the driver you are using. This makes it easier to check to see which driver number you need to search for if there isn't a centralized location to download it from. It is always essential to make sure your drivers are up to date on your computer to maximize stability and reliability. This software makes it simple to see if your drivers are out of date, so you do not need to manually check yourself by going to each manufacturer website individually.